The Adventures of Jimmy Neutron: Attack of the Twonkies is a video game released in 2004 based on the animated TV series The Adventures of Jimmy Neutron: Boy Genius. 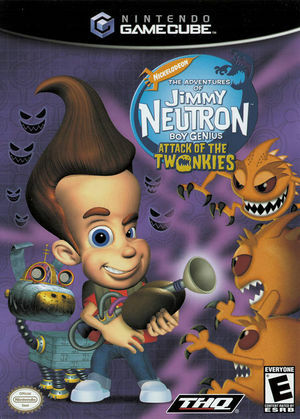 In the game, the player controls Jimmy Neutron in a quest to save earth from the alien 'Twonkies' using a variety of gadgets and inventions. The graph below charts the compatibility with The Adventures of Jimmy Neutron Boy Genius: Attack of the Twonkies since Dolphin's 2.0 release, listing revisions only where a compatibility change occurred. r7478 Windows 7 Intel Pentium E5800 @ 3.2GHz x2 ATI Radeon HD 5450 Works fine with directx9, game will crash with tiny bugs, and the sound is off. otherwise i got good speed with 30FPS at 100% speed. 4.0-3214 Linux Mint 17 Intel Core i5-750 @ 2.66GHz NVIDIA GeForce 210 Fails entirely to render (0FPS) using OpenGL backend, green screen @ 10FPS with software raster. Dolphin installed from apt-get, I suspect revision number is wrong. 4.0-9012 Windows 10 Intel Core i5-750 @ 2.66GHz NVIDIA GeForce GT 740 Fails to launch. Upon launch attempt, creates a black screen window, followed by an infinite loop of invalid read dialogs. Requires task manager to kill dolphin in order to stop. This page was last edited on 24 July 2018, at 12:37.